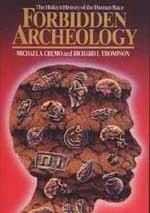 Since its initial release in 1993, Forbidden Archeology has consistently ranked as an international bestseller in the archeology category of Amazon.com. The original complete edition and its abridged popular version, The Hidden History of the Human Race, have caused shockwaves around the world, both in scientific circles and among the general public. "Michael Cremo and Richard Thompson are to be congratulated on spending eight years producing the only definitive, precise, exhaustive, and complete record of practicaly all the fossil finds of man, regardless of whether they fit the established scientific theories or not....It should be compulsory reading for every first year biology, archaeology, and anthropology student - and many others too." One of the prominent themes introduced in Forbidden Archeology is the phenomena of "knowledge filtration." This is the process by which scientists and others routinely accept evidence that supports their preconceptions and theories while rejecting, either consciously or unconsciously, other evidence that does not uphold their views. This process of suppression of evidence is illustrated by many of the anomalous paleoanthropological findings discussed in the book. This evidence now tends to be extremely obscure, and it also tends to be clouded by a series of negative reports, themselves obscure and dating from the time when the evidence was being actively rejected. Thus, evolutionary prejudices held by powerful groups of scientists act as a "knowledge filter" which has eliminated evidence challenging accepted views and left us with a radically altered understanding of human origins and antiquity. Why has Forbidden Archeology generated such intense reactions from the scientific community? One reason is that the book quickly became an underground classic, not only in alternative science circles, but amongst inquisitive seekers in mainstream academia. Its unprecedented comparison of both accepted and anomalous evidence for human evolution stunned scientists by showing that extensive anomalous evidence stands up equally well, if not better, than accepted evidence. After shocking the scientific world, Forbidden Archeology caught the general public's attention with the 1996 broadcast of an NBC-TV special called The Mysterious Origins of Man that featured the book. Establishment scientists felt so threatened by this program that they lobbied the Federal Communications Commission to censure and fine NBC for airing it. Thus by exposing this scientifc coverup and knowledge filtration network Cremo and Thompson revealed some painful truths about human evolution to the prevailing regime and subsequently threatened their exclusive monopoly of funding, intellectual authority, and social prestige.